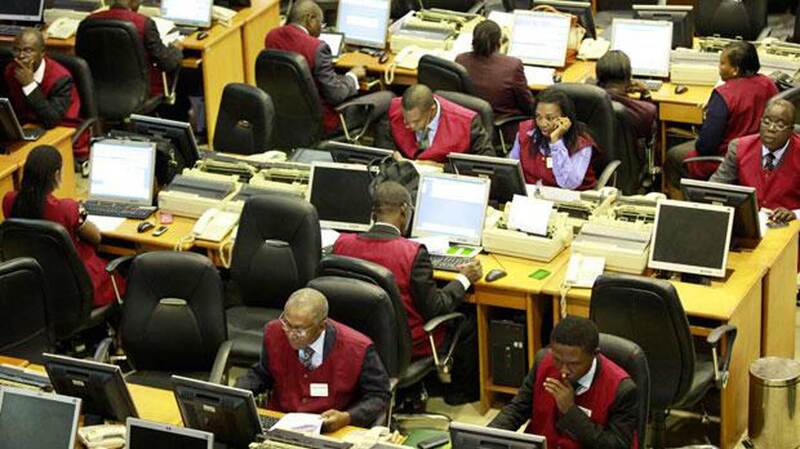 Investors on the Nigerian Stock Exchange (NSE) exchanged 8.66 billion shares valued at N97. 08 billion transacted in 89,911 in July, the News Agency of Nigeria (NAN) reports. A monthly data obtained by NAN from the NSE showed that the turnover increased by 12.32 per cent when compared with 7.71 billion shares worth N77. 92 billion traded in 100,895 in June. The Financial Services sector was the toast of investors with 7.45 billion shares valued at N68. 24 billion transacted in 51,991 deals. United Bank for Africa (UBA) was the most active in the sector having accounted for 2.96 billion shares worth N28 billion in 5,814 deals. It was trailed by FBN Holdings with 597.61 million shares valued at N3.57 billion transacted in 7,816 deals. A further breakdown of the month’s activity chart indicated that conglomerates industry came third with a turnover of 432.97 million shares worth N895.02 million in 4,249 deals. Transcorp was the toast of investors in the sector, accounting for 412.99 million shares valued at N601.78 million achieved in 3,276 deals, while UACN sold 17.11 million shares worth N290.42 million in 833 deals. Consumer Goods sector traded 346.18 million shares worth N15.02 million in 14,083 deals. Dangote Sugar Refinery was the toast of investors in the sector with 64.94 million shares valued at N606.24 in 1,156 deals and Dangote Flour Mills transacted 56.08 million shares worth N291.27 million in 1,944 deals. Oil and Gas sector trailed with 124.08 million shares worth N3.56 billion exchanged in 8,407 deals. Oando dominated activities in the sector with a turnover of 87.56 million shares valued at N659.72 million in 2,886 deals, while Eterna sold 13.12 million shares worth N49.49 million in 599 deals. Also, the All-Share Index during the period inched 2,730.27 points or 8.24 per cent to close at 35,847.75 against 33,117.48 achieved in June. In the same vein, the market capitalisation which opened at N11.452 trillion rose by N901 billion or 7.87 per cent to close at N12.353 trillion. Commenting on the market performance, Mr Ambrose Omordion, the Chief Operating Officer, InvestData Ltd., attributed the growth to increased confidence of foreign and domestic investors on the strength of improving economic and market fundamentals. Omordion said that the fundamentals were driven by the sustained intervention of the Central Bank of Nigeria (CBN) in the nation’s foreign exchange market. He said that the creation of foreign exchange products, the import and export, small and medium-scale enterprises windows among others helped to support the continued appreciation of the Naira, thereby ensuring stable exchange rate. Omordion, however, called for urgent implementation of the Economic Recovery and Growth Plan (ERGP) to complement CBN’s effort at boosting productivity to create employment and sustain the ongoing recovery. Malam Garba Kurfi, the Managing Director, APT Securities and Funds Ltd., said that the seeming positive data that supported the recovery move in the system for the past five months would likely continue with sustained foreign exchange intervention. Kurfi said that the apex bank sustained intervention in foreign exchange had boosted liquidity and confidence in the economy. Kurfi said that the market outlook for the new month remained mixed as less quarterly and full year were expected. He said that the economic recovery needed to be strengthened with the implementation of 2017 budget.